St. George’s, Grenada, October 8, 2012 – Over 120 students and teachers from Grenada, plus lecturers, scientists, entrepreneurs and government officials from the Caribbean Region and the Caribbean Diaspora gathered on 5, 6 October 2012 at the Grenada Grand Beach Hotel Conference Centre in St. George’s, Grenada to discuss how science, engineering and innovation can be promoted to help diversify the Region’s economies. The Caribbean Science Foundation (CSF) in collaboration with the Caribbean Diaspora for Science Technology and Innovation (CADSTI) and the Caribbean Examinations Council (CXC) organized the conference. The CSF was established in 2010 as a non-profit, non- governmental organization to assist with the diversification of the economies of the Region by promoting Science, Technology, Engineering, Math (STEM) education reform, and stimulating more technology-based entrepreneurship. The workshop was opened by the Hon. Tillman Thomas, Prime Minister of Grenada. Under the theme, “Stimulating Innovation and Entrepreneurship in Science and Engineering within the Caribbean,” the workshop’s main message was that science and technology based entrepreneurship is critical for the economic development of the Region, and that supporting such entrepreneurship as well as reforming STEM education will have a direct bearing on the Region’s future success. The CSF was referred to as a catalyst for science and technology innovation in the Region, and commended for the successful launch this past August of the Student Program for Innovation in Science and Engineering (SPISE) as well as the announcement of the new Sagicor Visionaries Challenge, a joint project between Sagicor, CSF and CXC. 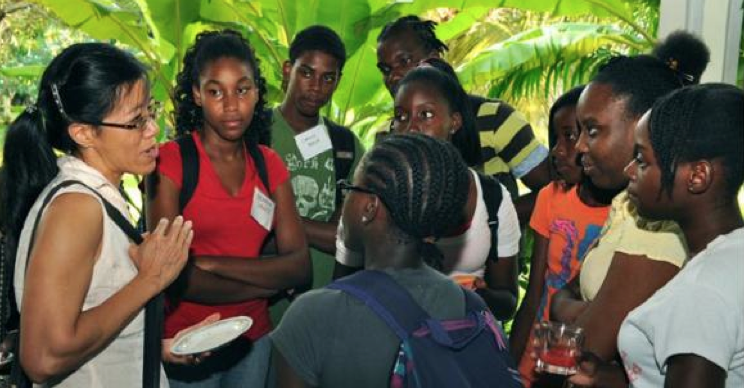 The CSF SPISE is an intensive four-week, enrichment summer program at the UWI Barbados Campus for gifted Caribbean high-school students who are interested in studying and exploring careers in science and engineering. The Sagicor Visionaries Challenge is a technology competition for Caribbean students and young adults run by Sagicor, the CSF and the CXC. Participants will develop technology solutions to problems in their communities, with financial assistance and awards from Sagicor. It is anticipated that the students who participate in these programs will become the future scientific, engineering and business leaders of the Caribbean in academia and industry. Key challenges for STEM education reform in the Region were emphasized throughout the 2 day workshop, especially at a roundtable discussion chaired by Sen.-Prof. Harold Ramkissoon, that included Hon. Senator Franka Alexis- Bernadine – Grenada’s Minister of Education, Mr. Glenroy Cumberbatch – CXC Pro-Registrar, Ms. Petal Punalall-Jetoo of the Ministry of Education of Guyana, Mr. Juan Tobon of Intel, and Ms. Caron Weston of the Ministry of Education of Antigua and Barbuda. These challenges included popularizing STEM, ensuring teacher qualification and training in math and the sciences, and connecting the theory of science taught in the classroom with the practice of science in the laboratory and in the field. Clearly, much more political will as well as support at all levels, including importantly financial support, will be needed to effectively address these issues in the Region. During the workshop, five participants volunteered to serve as local CSF representatives for their countries. These local representatives will disseminate information from and about CSF, mobilize youth, organize CSF-sponsored events, and assist with fund-raising. Most importantly, they will voice the needs, concerns, suggestions and accomplishments of their local communities to the CSF. The Ministry of Education of Grenada and the T.A. Marryshow Community College provided logistics support, and St. George’s University made a financial contribution. Going forward, the CSF will continue its push to raise US$13 million over the next three years to promote STEM education reform and technology-based entrepreneurship in the Region. More information about the CSF (and its projects that are in need of funding) is available at http://caribbeanscience.org. Individuals or organizations interested in supporting CSF projects may donate at Website or send inquiries to Professor Cardinal Warde (warde.csf@gmail.com). Inaugural 2012 SPISE a Huge Success!